Located in the Lake Buena Vista area, Indian Wells is recognised as the closest rental community to the attractions and means you have more time at the parks and not sat in traffic. With the largest pool you are likely to find in any rental home and offering excellent value for money, why settle for second best. "We thoroughly enjoyed our stay in your beautiful villa. It felt like a home from home and it was immaculate. Thank you so much. We would highly recommend it to our friends and family and would return in the future." "We have gone over to Florida for the last 14 years. We have stayed in some big 6 bedroom villas. But yours was best by miles. Our kids loved your pool. It was great to see them enjoy swimming for hours together." "We highly recommend Villa Lakeside for your holiday. We found it to be comfortable, modern, clean and well kept, with everything you could possibly need. It was very spacious, plenty of room for us. It has a wonderful pool, which sadly we only got to use twice as it was January and rather cold weather. Beautiful outlook from pool area overlooking a gorgeous lake. The area is very nice and well kept, being close to all the parks, which is perfect. The owners are very friendly and dealt with our booking efficiently and professionally. The management team responded quickly when we needed their help and were very polite. We definitely hope to return here in the future :)"
"This is our 3rd stay at the villa and will be returning later this year, secure property in a nice neighbourhood, location for parks, shops and restaurants is superb. Villa is very clean, pool & spa are fabulous, management company deal with any questions or queries promptly. There is an information pack in the villa with everything from fast food delivery, local shops, places to visit/eat and much more. Fantastic villa in a fantastic location, thanks again Gillian & James"
"Excellent villa, fantastic location, short drive to Disney, Universal and the malls. Pool and Spa a godsend!" 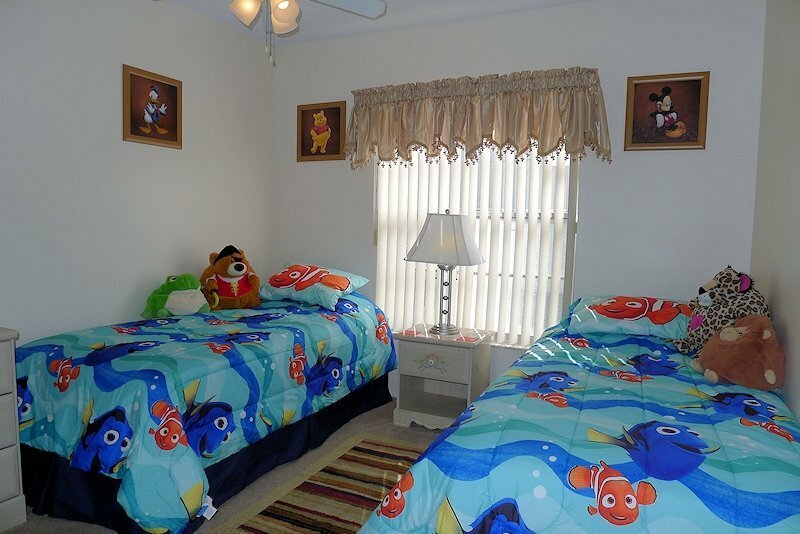 "Location wise we do not think it can be beaten, 7 minutes to the car park in Typhoon Lagoon, 7 miles from Amimal Kingdon which was the furthest Disney Park away. 2 minutes to Walmart, Five Guys, Publix, Longhorns. This a lovely homely, clean villa with a great pool and view of the lake. The beds are very comfortable and the wi-fi is great. It was nice to arrive at a villa and find that pool toys had been left for our use and there was washing powder and cleaning products. They are little things but they do make a difference and add to the enjoyment of the villa." "Great stay, great weather, fantastic pool and spa"
"The photos for the large pool at this villa do not do it justice! It is fantastic with great chairs and loungers and it is so peaceful and beautiful as well. The villa is well equipped with handy bath towels and beach towels to save you bringing them in your suitcase. In a great location from all the Disney parks and has everything we need including supermarket and restaurants all very close by. All information was well presented and the owners answered all of my many questions! I would definitely recommend it and hopefully will get to return one day!" "Villa was everything I had been looking for.....clean and tidy and very appropriately furnished and at a very reasonable rate. I have been renting villas in Florida for many years but this was the first time I have been in this area. I found that the location was surprisingly handy for my requirements." "From booking to leaving, things couldn’t have gone smoother. We felt very at home as soon as walking into the villa. Very nice lay out, the cut out from kitchen to diner/living room meant I could watch the TV whilst prepping food. (Fantastic selection and functionality on TV BTW - voice control and search means you don’t have to learn what channels show what; arrived, picked up remote, said ‘Tampa Bay Lightning’, was watching the game in HD instantly). January stay, we had pool/spa heating - it stayed at a very comfortable temperature all week. Location wise, best we’ve ever stayed at, Wal-Mart 2 mins away, Publix 3 mins if you prefer a ‘nicer shopping environment’. Plenty of bedding/towels available, washing machine and tumble drier did a fantastic job. When we can afford to return to Florida, this will be top of the list for checking availability." "The rental was very straight forward and the owners had very clear instructions on how to access the property. The house and the pool are very clean and the kitchen is very well equipped. Our stay was fantastic and we highly recommend this house and would stay there again in the future." "The villa was great and the pool and spa were fantastic.The location was excellent, so close to the 192 and very easy to get to Disney." "What a lovely villa. It met our requirements exactly. The condition of the interior and the thoughtfulness of the content made it a home from home. The location of the property makes it an ideal choice for those who like the Parks and the shopping and as we were out during the Thanksgiving period we made good use of the sales! The WIFI and television channels were second to none. We would book again. Just have to decide when and if we bring any one else to enjoy the villa with us." "We all had a fantastic stay, the villa was very clean, the kids loved the pool and the location was absolutely fab. We will definitely be recommending to friends and family and will definitely book again in the future." "2nd visit and hope to return again, villa, pool & location is superb. 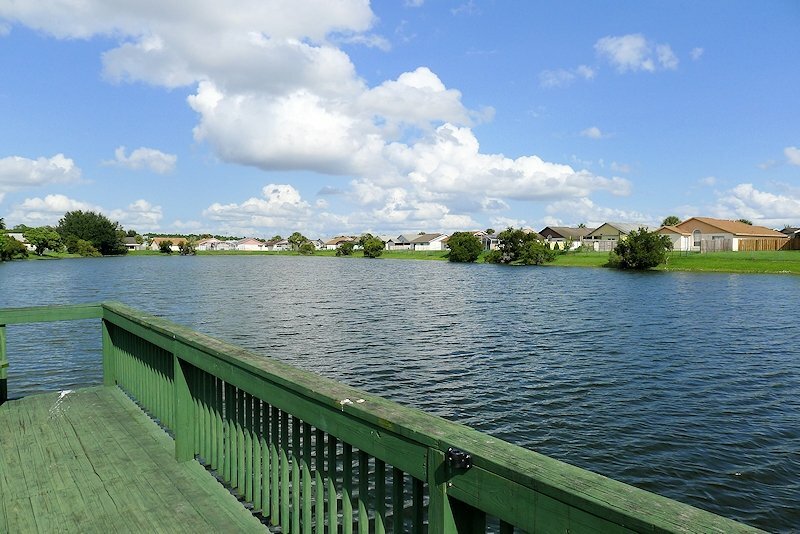 Easy access to parks, outlets and malls." "Have visited Orlando 14 times over the last 30 years. This is the second time we have been fortunate enough to stay lakeside villa. It is by far the loveliest outside area and pool we have had. Also it is the only villa we have stayed in that has enough sun beds and outside chairs for all the occupants which is a lovely touch and the best location. Thank you again"
"This is our second stay at Lakeside Villa, a true home from home, ideally placed close to the 192, Walmart few minutes away. The villa is very clean with large comfortable beds, nice en suite in the master bedroom also has family bathroom. Lovely pool area with comfortable furniture. Secure property with nice neighbouring properties. Any questions or enquiries are always answered promptly every bit of information on a Florida holiday is provided on the web site and also in an information pack at the villa, from local shops, places to visit, places to eat, fast food deliveries you couldn't ask for more. Hopefully our 3rd visit wont be too far away. Thank you Gillian & James for sharing your home"
"We have just returned from a fantastic three week stay at this beautiful villa. It really is only a short distance to all the parks. We didn't hire a car this trip and found it easy to get a taxi to all the parks and walk to the Walmart round the corner or the restaurants just down the road. The villa itself is lovely with everything you will need plus more! The pool area is simply amazing.....we spent hours out there. We will be returning in the future. Many Thanks"
"Both my husband and I had an excellent stay at villa lakeside for our honeymoon. We have stayed here for 3 weeks and had no issues or concerns. If we did have anything to feedback this was dealt with in a timely manner. The villa was exceptional and pool and jacuzzi were amazing and used these on a daily basis. The weather was amazing and we had the sun all day. The location is right in the middle of everything and everywhere was easily accessible. We would highly recommend anyone to stay at either villa lakeside or elegance and we can't wait to go back as we will be booking up. Thank you to James and Gillian for a perfect stay and the management team for dealing with our queries accordingly." "Fantastic stay at Lakeside villa. Everything you could need and more along with the convenient location made it the perfect holiday. Would highly recommend to friends/family." "Excellent location and facilities. The pool was superb size and overlooking the lake was a big bonus." "The villa was in a perfect location and the facilities were absolutely first class. 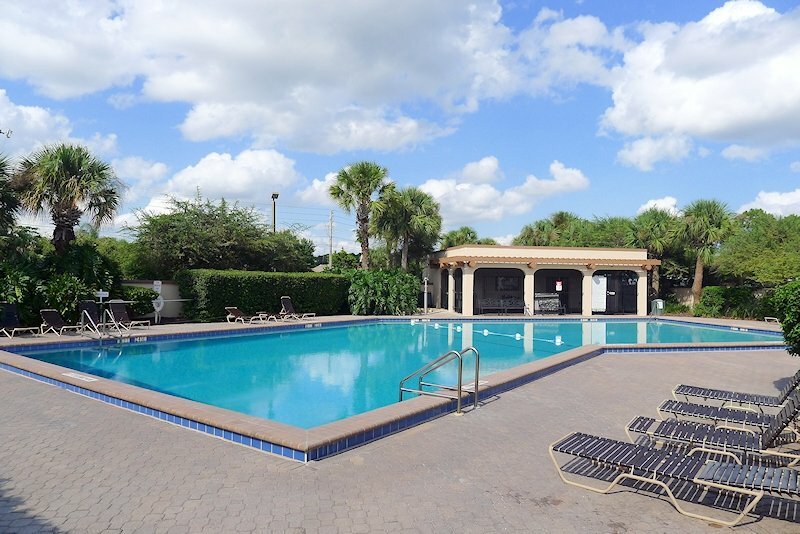 I have stayed in a number of villas in Florida before but this was by far the best and I will definitely plan to stay here again"
"Great location, beautiful villa with lots of personal touches, nice and comfy lounge chairs at the fabulous pool (perfect for a relaxing day). Love the area, it is great for everything, dining, excursions, theme parks... This is a home I would always come back to." "Highly recommend this villa, the location and pool is excellent. There were no issues with the villa which was clean and tidy. The booking was easy and efficient and Gillian and James were very friendly and helpful on the telephone when booking. A very happy stay and one where I will stay again." "We had a fantastic vacation, Lakeside is a great villa and base for your Disney vacation, it is ideally located for the Disney parks. The villa is fully equipped so you can enjoy meals in and take care of your washing/ironing if you so wish. The pool was awesome, it is very private with great views of the Lake. 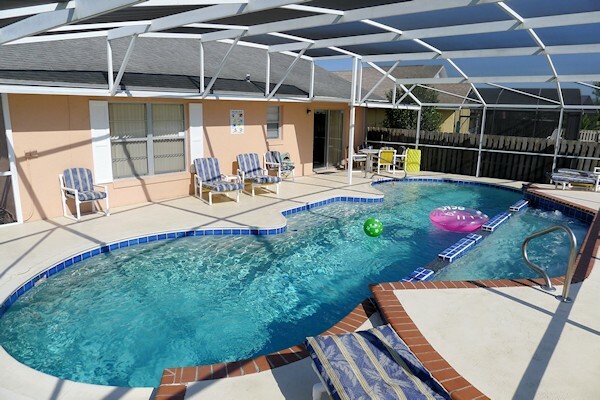 We will definitely stay here again and we will also recommend the villa to family and friends looking to visit the Orlando area." "It is an amazing place to stay at...enjoyed it the most from all our trips to Florida and am sure we will return as soon as our circumstances allow us too." "We found it difficult to think of any faults, so much had been thought of. The little details made a huge difference such as plenty of towels and coat hangers and the night lights plugged in." "This was our fourth time to rent a villa in Orlando and we can honestly say Indian Wells was by far the best for its location. The property was clean, in good condition and came equipped with everything we needed for our stay. The owners also provided handy tips and information on the area which we found very impressive and on our return asked us to complete a survey - clearly they have a genuine interest in their property and guests. This was obvious right from the start as they were very quick to respond to emails and provided us with the information we needed to travel including clear directions and a map etc. (With previous rentals we were often left waiting for responses and information on how we would access a property which naturally can be worrying). We also felt it was very kind o"
"Another lovely stay at one of James and Gillian’s villas. Perfectly located for all parks, shopping, eating out and airport with all the homely touches that we have come to expect from them." "Had a fantastic stay at this well-equipped, perfectly located villa. Will definitely visit again. " 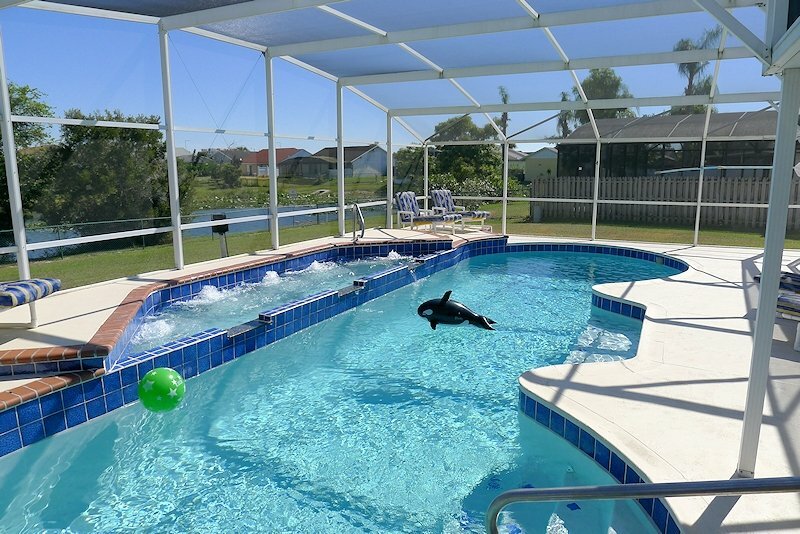 "We have been to Florida many times, but I think we have to say that your 40 feet long pool is very special, and we were absolutely delighted with the location of the property and how well it is looked after and maintained by Chip and Elizabeth. It is one of the most convenient and best, if not the actual best, location of any property that we have rented. We actually met Chip and Elizabeth from the management company and they could not have been more helpful.to us." "Best location ever and we have been to Florida 8 times. First time ever we had enough sun beds and chairs etc for everyone. It was great." "Very large, spacious, comfortable villa with fantastic views over lake, feeding the ducks and birds became a breakfast duty. Only a short drive to Walmart so handy for those tasty turkey legs. We have thoroughly enjoyed our stay in Lakeside and would come again." 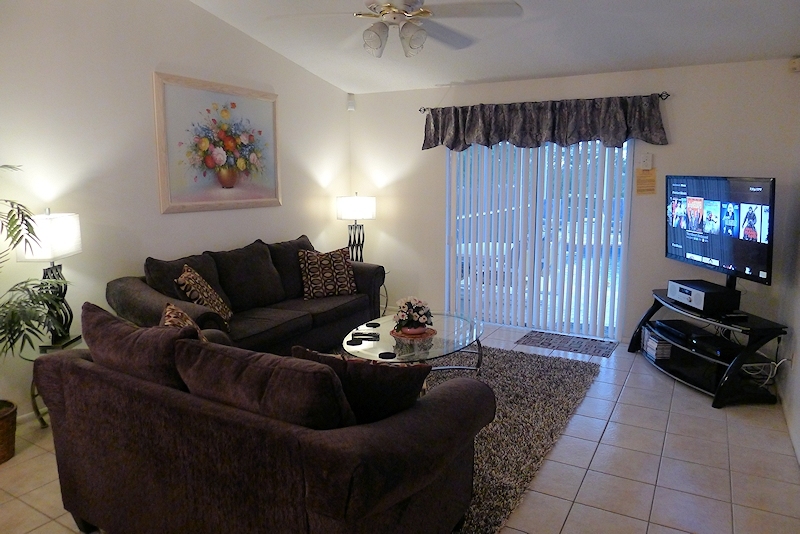 "Having stayed in the Kissimmee area many times before we think we have finally found the perfect location. 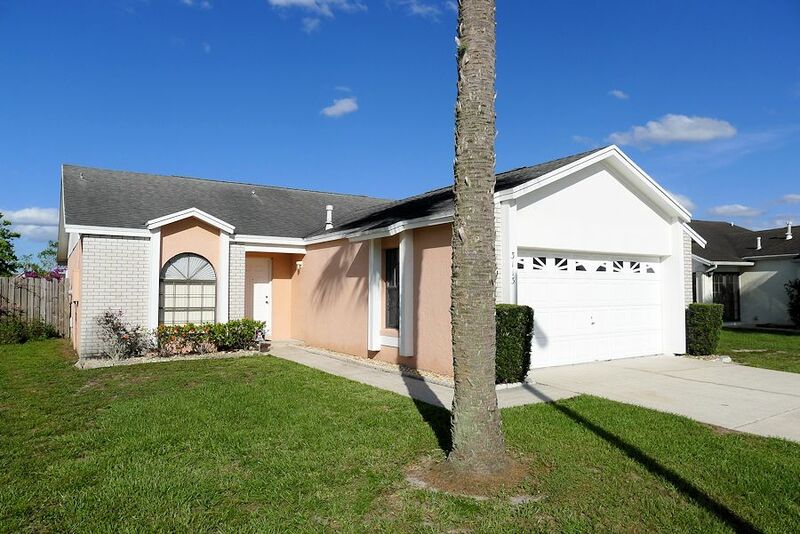 The villa is situated right in the thick of things, two minutes from the 192, five minutes from Disney and the premium outlets and 15 mins from Universal. " All quoted UK Sterling rates are inclusive of sales tax. For stays of more than 7 nights, all prices are calculated on a pro-rata basis of the weekly rate. Discounts are available for stays of 21 nights or more. Stays of less than 7 days may incur an additional cleaning fee. Please note that we are unable to accept bookings of less than 14 nights for dates around Easter, Christmas/New Year and holiday periods. To confirm a booking, we require our on-line reservation form to be completed (we shall send you through the link) and payment of a 20% deposit. The balance of payment along with a refundable security deposit is due 8 weeks prior to your arrival date. Where your arrival date is within 8 weeks, then full payment must be made to confirm the booking. To make booking straightforward, it is possible that we can hold your dates to enable you to finalise other travel arrangements. To make full use of the pool during the cooler months of October through to March, pool heating is recommended. This an additional charge of £115/US$170 per week. Pool heating is not available in the high summer months. With such an unrivalled location, expect endless choice when deciding where to eat in the evening, especially with highway US192 and SR535 adjacent. Both of these are packed with restaurants, shops and bars - Chillis, Smokey Bones, Uno Pizzeria, Longhorn, TGI Fridays, Bahama Breeze and Olive Garden. Situated on the edge of Indian Wells is a WalMart (which is within walking distance) and a series of local shops, eateries and bars including the Cheers sports bar. Frankie Farrells Irish restaurant is located the other side of the road in the Lake Buena Vista Factory Outlets. These are a quieter alternative to the Premium Shopping Outlets which are located approximately 3 miles north on SR535. With quick access to the new 'The Loop' complex, means a fantastic vacation with everything on your doorstep. The spacious living area is very comfortable, fully air-conditioned and tiled with a vaulted ceiling. 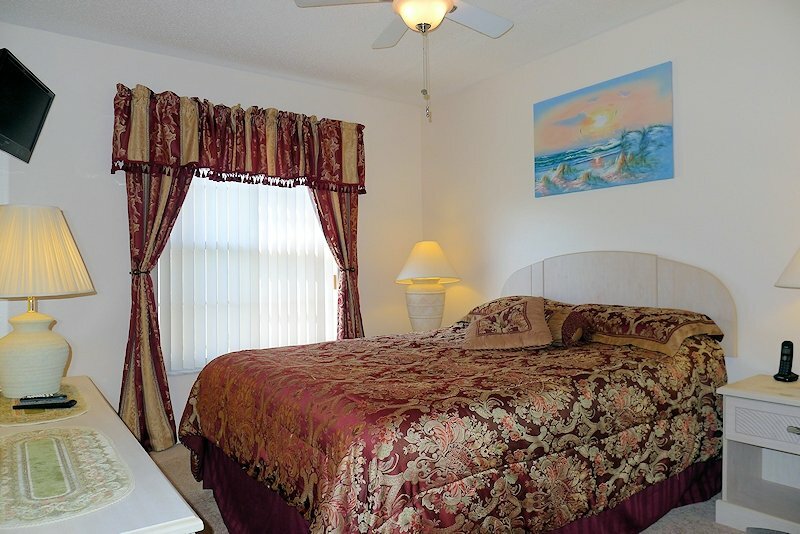 For added comfort, the villa has ceiling fans throughout. Furnishings include a queen-sleeper sofa, love seat, occasional tables and lamps. Check up on the news using your phone or bring your laptop, as we have FREE super-fast 100Mb Wi-Fi. 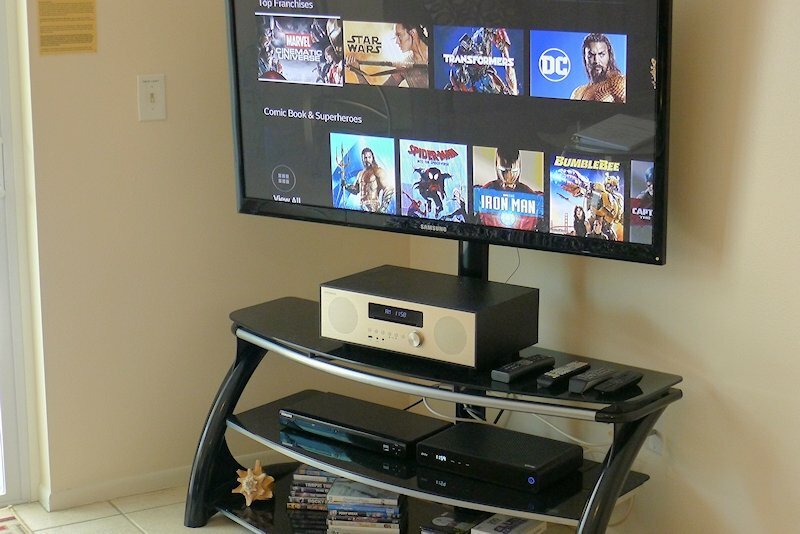 Relax in the evening watching the huge 51” TV with premium cable and over 50 On-Demand HBO channels or listen to a CD. There is a read & swap selection of books and family board games. Enjoy meals at the kitchen table, the main dining table or around the poolside table. You will find everything that you need in the fully-equipped kitchen - including American fridge/freezer (with ice machine), cooker, microwave, blender, coffee maker, dishwasher, toaster and pans. For everyday essentials, WalMart is on the edge of Indian Wells and there is also a Publix supermarket less than a five minute drive. The master bedroom which overlooks the pool area has a huge king size bed, en-suite shower room and walk-in closet. There is also a television and telephone. 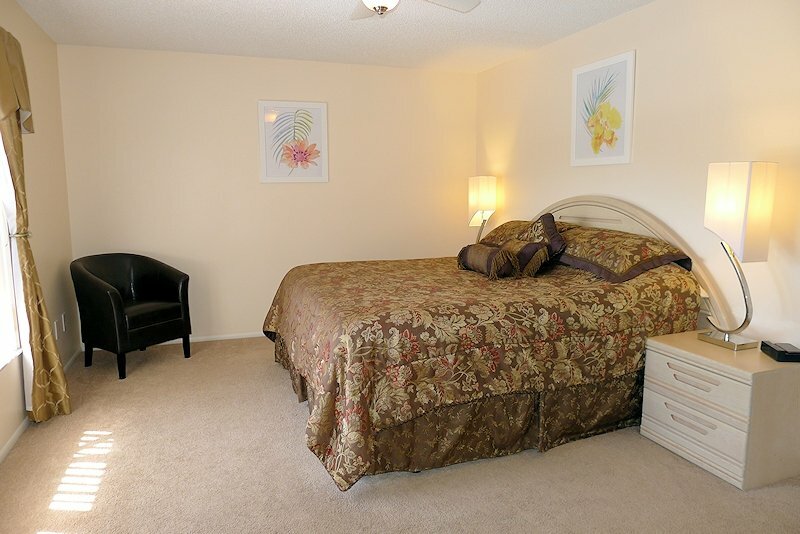 The second bedroom has a queen bed and third bedroom has twin beds. Both are serviced by a separate family bathroom. A TV is in the queen bedroom and both have adequate cupboard and spare bedding. Televisions in the bedroom also have premium cable and on-demand movies. Huge 40ft pool and deck - perfect for Florida! Forget those ’tiny’ pools you have had in the past... the pool at this villa is huge – the best part of 40ft long and 6ft deep. There are very few villas that offer such a fantastic sunbathing and relaxing screened pool area with views over the Indian Wells lake. For smaller children or simply to chill-out, there is a separate 17ft long spa alongside and for added privacy, the yard is fenced between the neighbours. Enjoy the Florida sun on our padded pool furniture and take lunch al-fresco at the poolside table and chairs. For evening swims, there is a deck and pool light. For the cooler months, the pool may be heated for an optional charge. All the linen and towels that you will need are provided, as well as full laundry facilities including washing machine, tumble dryer, iron and ironing board. We are child-friendly and provide cot, high-chair and stroller for your use if required. The living room patio doors have alarms so that children cannot access the poolside without knowledge. The villa has a monitored security alarm system for your use and our friendly Management Company are readily available should you have any queries during your stay. There is also parking for up to four cars, which for your convenience (especially during a thunderstorm! ), we have an electric garage door opener. 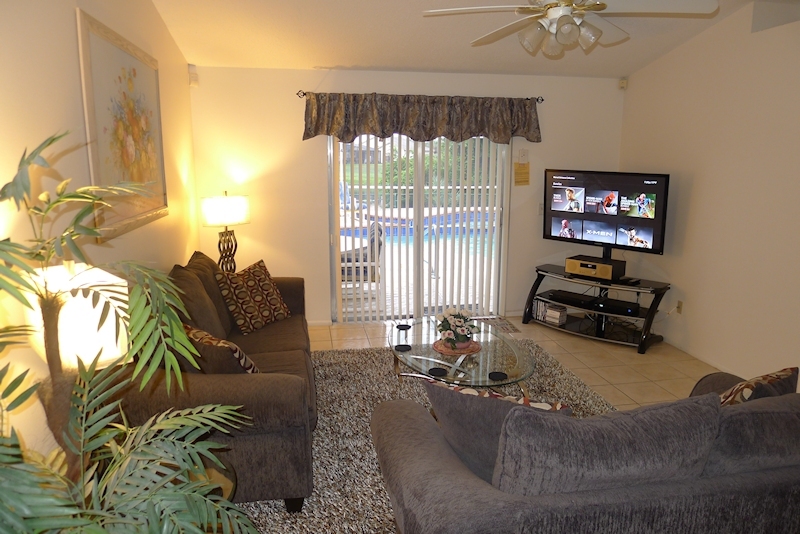 The villa is fully equipped and licensed in accordance with Florida law for rental properties.